Morning macchiato or late night espresso? On London’s South Bank the selection of cafes, bars and restaurants is as diverse as the range of coffees they serve. Check out our guide to the very best venues for your daily caffeine fix! Our usual haunt for coffee + people watching is the Riverfront at BFI Southbank. Having just been refurbished, the delightful coffee spot is now a real treat. With spectacular views of Waterloo Bridge and the River Thames, the vibrant BFI Riverfront Restaurant & Bar is the hottest spot in South Bank. Grab a coffee, relax and watch the world go by. The new Art Yard Bar & Kitchen at Bankside Hotel is an informal design-focused, all-day restaurant. The serene art haven is perfect for your morning latte. Delight in your surroundings and get ready to start the day. 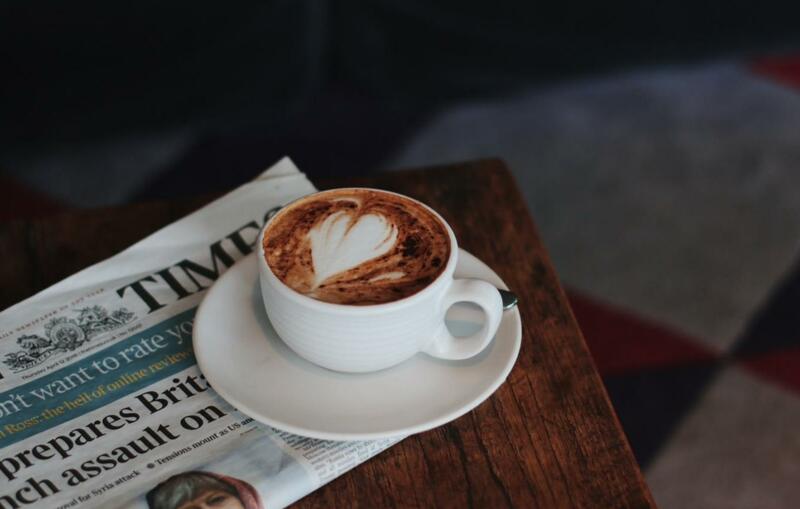 The National Theatre's Espresso Bar has a renowned team of talented baristi and was even voted one of the top 50 independent coffee shops in London by the Evening Standard. Offering a simple range of espresso-based coffees, made from Mozzo’s 100% Arabica Red Label coffee beans, they’ll give you a quick caffeine hit guaranteed to keep you alert during even the lengthiest theatrical production. For more information on the Espresso Bar click HERE. Why not swap the morning paper for a game of chess? Known for satisfying thirsty gamers, we also rate Draughts as hotspot for coffee drinkers. With a bank of 800+ games, we can guarantee Draughts will bring a little challenge to your morning coffee ritual. The quirky games cafe sits in Leake Street Arches. Let the kids go skating while you kick back with a cuppa. The Wall SE1 is a café with a difference. The New Yorker themed joint is part of House of Vans – the skate park under Leake Street Arches that also holds gigs, art exhibitions and more and is constantly fuelled with creativity. Offering up daily baked goods, grab yourself a coffee and soak up the atmosphere while the kids skate to their hearts content. For a more leisurely latte, make your way to Kitchen, the National Theatre's brand new all-day café. Here you can linger on the riverside terrace and indulge with a delicious slice of homemade cake as you sip your coffee and soak up the atmosphere. For more information on Kitchen click HERE. We love the Old Vic's Scandi-chic relaxed all-day artisan café. Serving up Workshop Coffee, unique drinks and seasonal dishes from the best London suppliers, it's a hidden gem in the area for a delicious coffee in a relaxed setting. They have WiFi of course, and a selection of suitably cultural and artistic magazines to flick through whilst you sip. For more information on Penny, click HERE. Enjoy a tranquil moment on the rooftop terrace of the OXO Tower Restaurant, Bar and Brasserie, where the quality of the coffee is surpassed only by the breathtaking views across the Thames to Charing Cross and St Paul’s Cathedral. For more information on OXO Tower Restaurant Bar and Brasserie click HERE. If you prefer to take your coffee in a less traditional setting, the quirkily named Beany Green serves artisan coffee from a converted shipping container opposite the Southbank Centre. Grab yourself an iced latte, fall into one of their brightly coloured deck chairs and watch the boats sailing by. For more information on Beany Green click HERE. Sustainability is a core value for the team at Skylon so it should come as no surprise that they only serve Rainforest Alliance coffee. If you’re looking for an extra kick why not try an espresso martini, coffee augmented with a shot of the finest tequila? That should get you in the mood for another cocktail. For more information on Skylon click HERE. Espressamente illy at the Park Plaza Westminster Bridge strives to bring an authentic Italian espresso experience to London. The renowned illy coffee blend is served along with a dazzling selection of snacks in a sleek modern environment. Close your eyes, breathe in the pungent aroma of fresh coffee and be transported to Milano! For more information on Espressamente illy click HERE. Claiming to travel the world searching for the perfect bean, Black Sheep Coffee is simply a haven for coffee lovers. Started in London by friends who were flatmates at uni and decided to quit their jobs on the same day, Black Sheep Coffee not only provides a perfect cup but is helping the homeless and getting rid of plastic along the way.